Setting up a bearded dragon tank can be a very confusing task, especially if you are a beginner reptile keeper. My service will help you to understand what you need to do and why you need to do it. "I will help you to create an awesome looking, natural habitat for your dragon." You are a beginner when it comes to reptiles and you feel overwhelmed by all the information about reptiles. You are confused by the information you read on the internet (forums, etc.) and you get more and more insecure about setting up the tank, because you are afraid to make mistakes. You want to make sure that your bearded dragon lives in an appropriate, healthy environment. You simply don´t want to do all the confusing research and you want a straight to the point guide on how to set up your bearded dragon tank. Quick communication within 6 to 12 hours via email. Complete instructions on how to set up your tank. 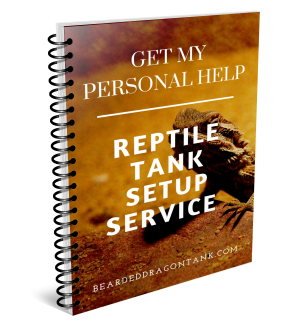 I answer all question you might have during the process to make sure that you are confusion-free when it comes to bearded dragon tanks. I consider tank equipment you might have already bought in order to save you money. Whether you need a tank for 5 bearded dragons, 1 bearded dragon, for a baby bearded dragon or you need a solution to separate your bearded dragons - I consider your wishes as best as possible. Whether you are a man or a woman, you will feel like the mother of dragons after you know exactly how dragon housing works! Get my Tank Setup Service now! This service will even help you to save money, as you are going to get the best tank equipment right from the start and do not have to buy equipment twice, because you bought low quality equipment due to misinformation. Keep a healthy bearded dragon. Reptiles can get sick, it happens. However you can minimize that risk by creating an appropriate environment for your little friend. This way you avoid losing your pet and you avoid high vet bills. Avoid exhausting research. There are dozens of opinions on how to set up a bearded dragon tank the right way on the internet. How are you supposed to know which of that is the right way as a beginner? My service will tell you that - right to the point! Save Money! Many people get the wrong setup in the beginning. That happens due to misinformation from pet shop sellers who only want to sell, getting the wrong information on the internet, or simply unknowingness. Keeping reptiles is an expensive hobby, there is no need to make it more expensive than it has to be. "I just wanted to take the time to thank you for helping me setting up my dragon tank. Because of you I didn´t lose my little Spencer. Spencer is amazing! In the new environment he is so active, jumping around, digging through his little hides and hunting like crazy. Also, the tank looks simply amazing now!" “Thank you so much for your help. At the beginning I was so worried about my Garona, but after you helped me I feel much more confident that I keep her correctly. Thanks for asking all my questions, too." Purchase my service via Paypal and you are going to receive an email from me to your Paypal email where I exactly ask about your situation, what kind of tank you want to build and if you already have tank equipment etc. After that I will send you exact instructions on what you should buy and how to set up your tank. We will stay in close contact and I will answer all the questions you have during the process. I will make sure that your tank runs correctly and that it is ready for your bearded dragon to move in for a small fee of $37. You´re Protected By My 30-Day “ I changed my mind” period. If you don´t feel that you received at least $37 of value through my service, email me and ask for a refund. However I am very confident that you will experience way more value than $37, but you can decide for yourself. Not from my side. I just recommend to get a certain equipment, that does not mean you have to buy anything. In the end I am just trying to help you to get on the right track. Do you help to set up tanks for other reptiles as well? Yes, I do. Most of my readers own bearded dragons, but I also set up tanks for leopard geckos, chinese water dragons etc. Just tell me what you need. I am short of money, can you compile a cheap tank? I always try my best to recommend equipment that is high quality and low priced. I can give you tips on how you can save money while creating a bearded dragon habitat, but please be aware that keeping reptiles involves high initial costs. In the end I would not help you if I would recommend low quality products just to help you to compile a cheap tank. Most probably you would end up buying everything twice, because the parts broke. However, as I said, I have some tips on how you can save money and still end up with a high quality tank. What if I don´t like the setup you recommend? No problem, I help to set up the tank as you like it. As long as it is an appropriate bearded dragon tank. Make sure that you have a great start with a happy and healthy bearded dragon!